Hello, friends! I’m back from CreativeWorld show (it’s an annual show happening at the end of January in Frankfurt, Germany) and I’m ready to continue sharing my projects with you! 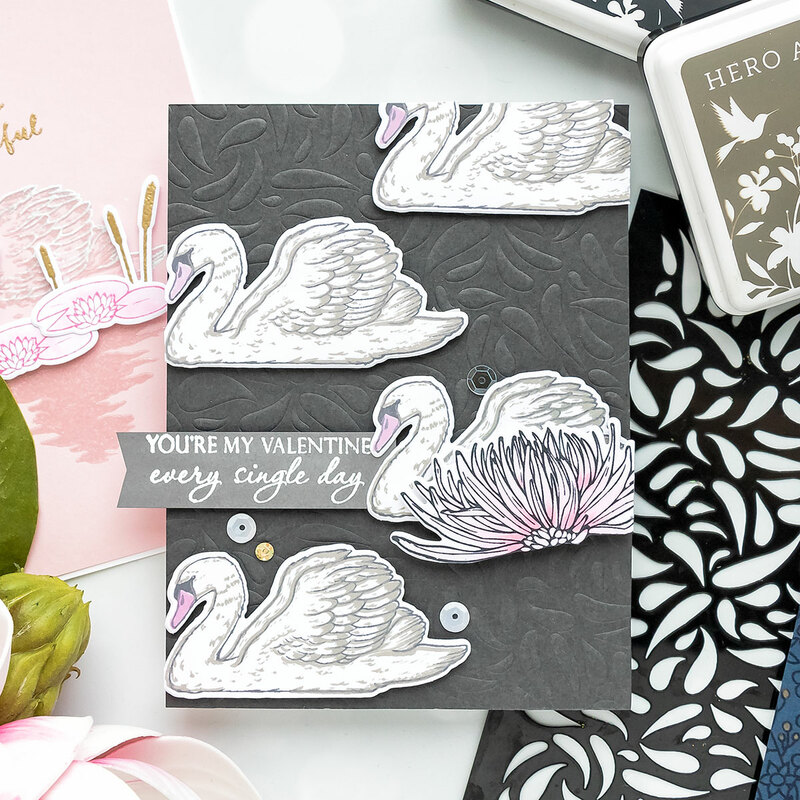 Since Valentine’s Day is right around the corner, I have a few Love & Friendship cards using the Hero Arts Color Layering Swan set. For my first project I wanted to create a bold and beautiful background. I stamped Flowers for Coloring Bold Prints background stamp in VersaMark embossing Ink on dark blue cardstock. You know me, I love the look of colored pencils on dark cardstock so I reached for my Polychromes colored pencils by Faber Castell and did some quick coloring. Having colored this background I moved onto stamping the focal image for this card – a gorgeous swan! I pulled out my mini MISTI tool. I used Navy ink for the outline layer, I adore this dark, deep blue color and I often use it in my card making. For the detail layer, and this stamp set has just 2 layers to it – an outline and a detail, I used a lighter blue, Pool color. I also used the same Pool color to stamp the beak of the bird and next die-cut the image out with the help of a coordinating die. 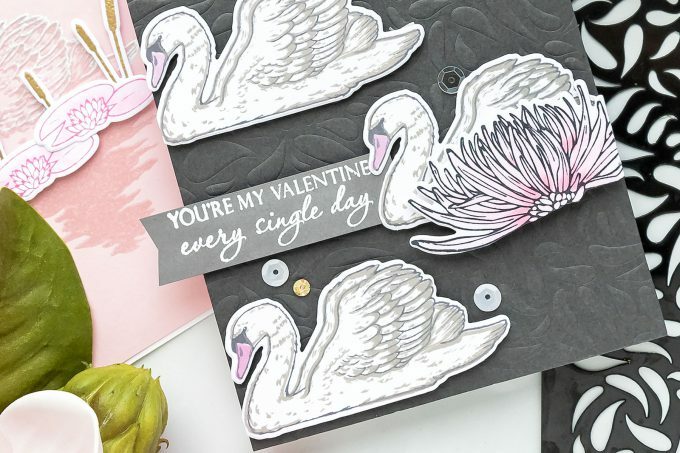 I had envisioned this card with my gorgeous swan in the center of my beautiful colored panel with a simple sentiment next to it. 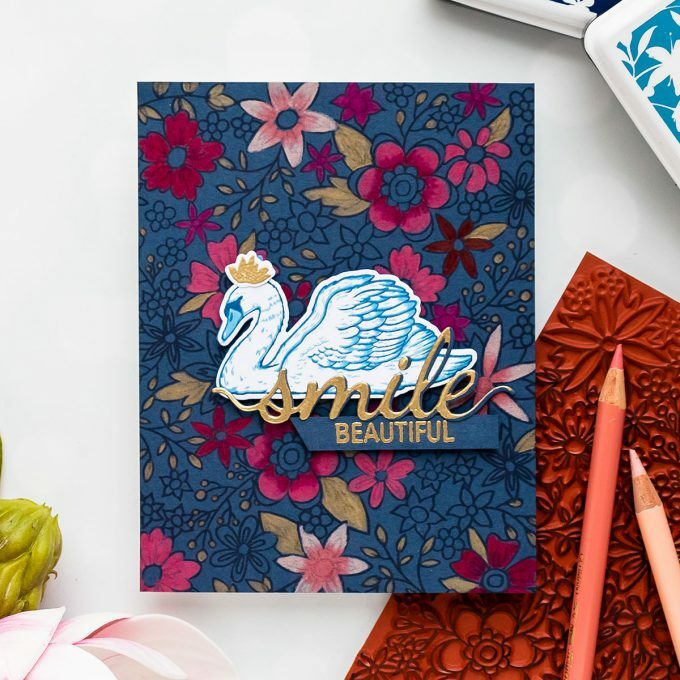 I gold heat embossed one that reads “Smile, Beautiful“, I feel it’s a fitting message for a card like this. 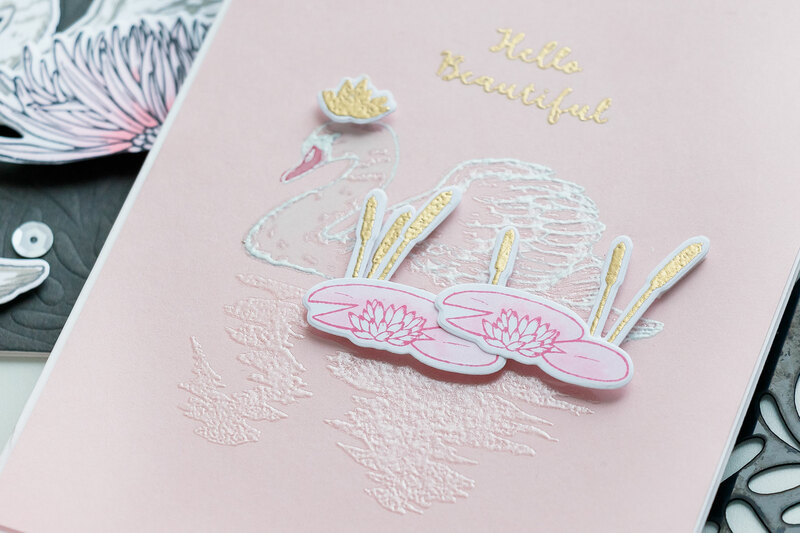 I used stamps and a die from the Smile Stamp & Cut set and because swans are often pictured wearing a crown I made a little crown for my swan to wear on this card using a flower images from the Color Layering Armadillo set! The size and shape of this image had worked perfectly for this swan! After foam mounting my images onto the background I adhered the background panel onto an A2 white side folding card base to finish my card. For my card idea #2 I was itching to try heat embossing. Swans are usually white, of course there’s a black swan from time to time, but I was keen on trying to create a white swan for my card. 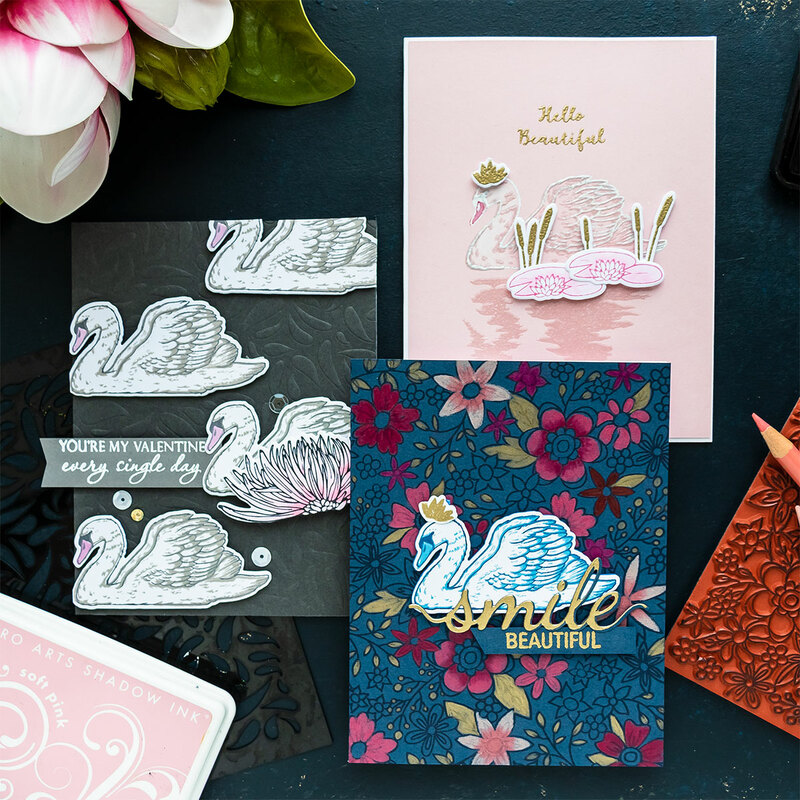 I decided a white swan would look best on colored background so I picked a light pink one and after inking the outline image with clear embossing ink, VersaMark, I stamped the image in the center of the panel and heat set it in white embossing powder. For my detail layer I used Satin White Pearl embossing powder. If you’ve not used this product before – you are missing out as this embossing powder will give you the coolest effects on paper. 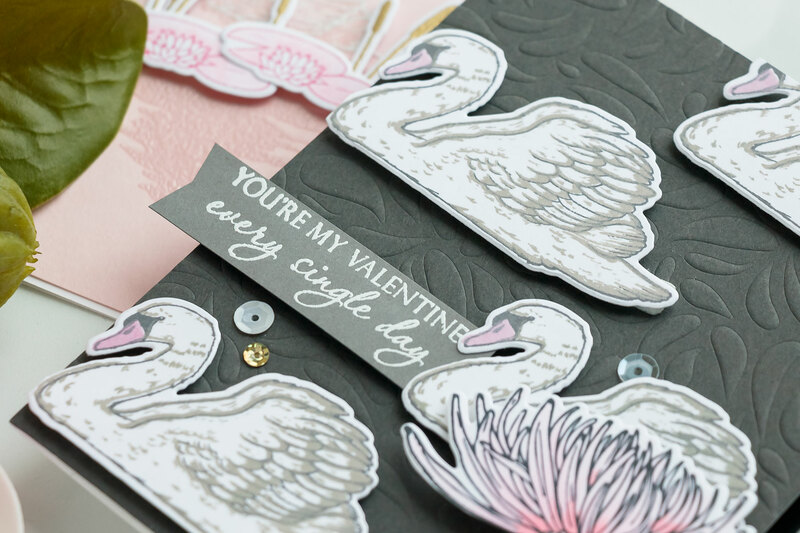 To finish this card I stamped and heat embossed a few additional images from the Color Layering Swan set. For my final card idea I wanted to create a lake full of swans! I stamped and die cut several using Charcoal ink for the outline layer and Wet Cement for the detail layer. This gave me beautiful white swans with gray shading. For the beaks I used Soft Pink color – gray always goes beautifully with pink, so it looked really nice in the end. 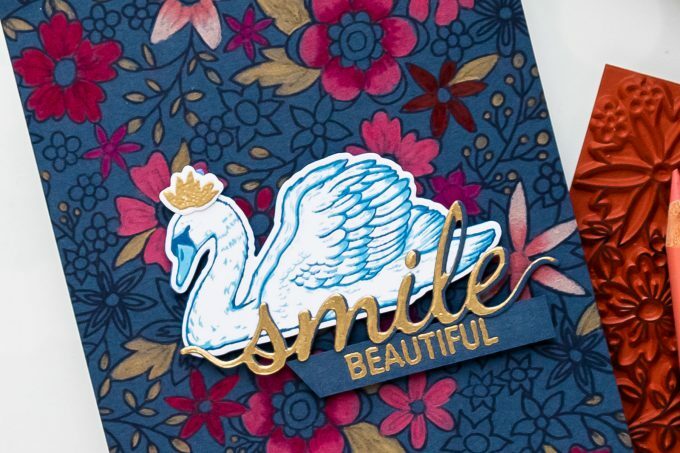 I used my coordinating die and die-cut swans for my card. I wanted to have a big flower on this card to make it look like as if my swan was behind it. 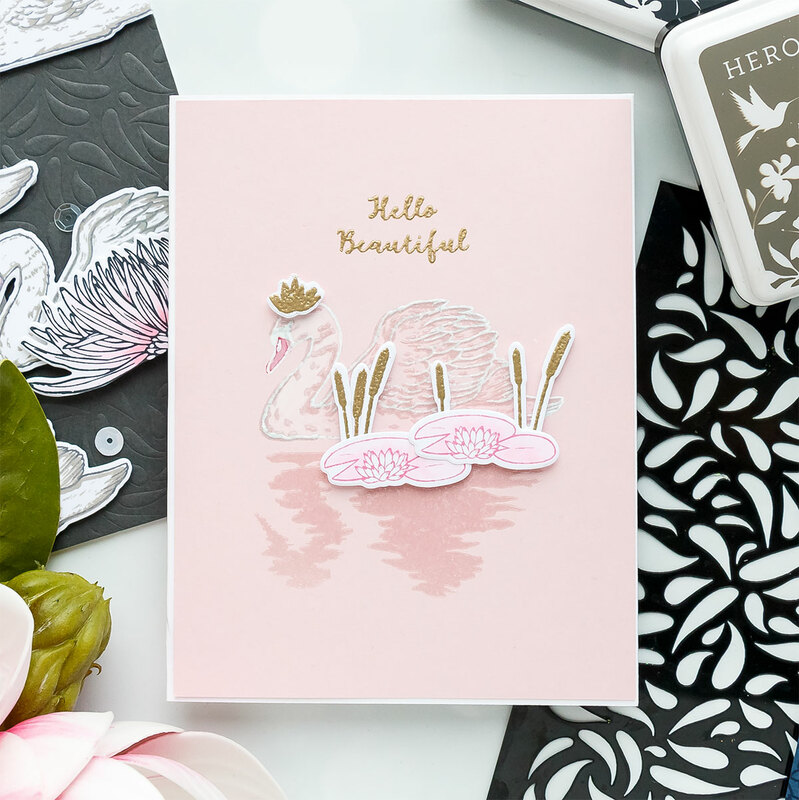 I stamped a gorgeous mum from the Hero Florals Mum Stem stamp set in Intense Black ink and colored it very light pink using my Copic markers. I used RV00, RV10 and RV23. I cut the image out using a coordinating die, next cut the stem off using my scissors and arranged everything as I had planned. Next, to spice up my background I dry embossed a dark gray cardstock panel using a stencil from the Petals Stencil Pair set. The design of this stencil looks like drops of water and it went perfectly with my card design here. I foam mounted the die cut images in place and added a Valentine’s Day sentiment that reads – You’re my Valentine every single day. This sentiment comes from the new All My Love Decorative Hearts set. I also used a few sequins from the Champagne sequin mix to embellish this card. I hope this video & blog post has given you some stamping ideas to try with your color layering stamp set from Hero Arts. Welcome back from Frankfurt (where some of my ancestors are from!). Sounds like Germany has their own version of Creativation?? I like the pink card with the swan. So pretty. I have some of the pearlized embossing powder but haven’t used it much … yet! Thanks, Yana.